As a foreigner living in Bangkok, many people would wonder how do I get through with my daily live without speaking Thai language. Well, in Thailand, English is quite a popular foreign language. 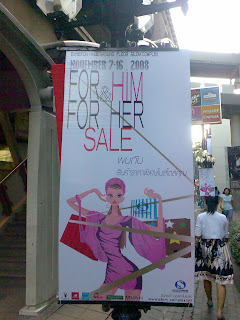 I notice that Thai culture has an interesting way that uses English as title or slogan for many things. For example, they would have English name for sales in departmental store like ‘Midnight Sale,’ ‘Halloween Sale’, etc. However, other that the name of the sale, the rest are in Thai including date. So, I am clueless as when should I go to shop. In Thailand, most of the road signs are bilingual. So, for foreigners who would like to drive from one place to another, that shouldn’t be a problem. The only downside is that if there are any traffic update signs on the road, they would be in Thai. So, it’s wise to drive with someone who can read Thai. Many foreign magazines such as Elle, Wallpaper, Men’s health, etc come in Thai version. When I first went to a book store magazine section, I saw many magazines with English titles. I was excited to flip through them. To my disappointment, the content was 99.9% in Thai language. I don’t blame the magazines as this is Thailand. I shouldn’t expect that magazines come in English to please foreigners like myself who can’t read Thai. So, I can only look at the beautiful pictures in magazines since a picture is worth a thousand words. I guess they are right about don't judge a book by its cover, in this case, a magazine. I guess English in Thailand is practically 1% in almost everything. I do have friends who pick up speaking thai quite quickly but I don't think he reads though. Yes, indeed... speaking Thai is easier than reading. Thai language is more complicated than English is some ways.